ROSHEIM : ( In Alsatian, the home of the roses ), a small town with a rich medieval past, located on the “route des vins” just under the Mount Sainte-Odile. ROSHEIM is very proud to have a Rose Garden developed and maintained by a group of 50 volunteers of a local association ( l’ association des Arboriculteurs du Piémont de Sainte-Odile), ready to take you for a visit. ROSHEIM and the roses; a long established story starting in 1980. At the beginning, in order to attract new members, the association extended its activities to growing roses alongside fruit trees and bushes. With the difficulty in finding the right space, the group involved in this project had to relocate to nearby OBERNAI until 1994. 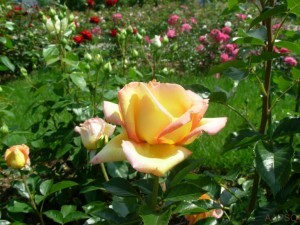 In the meantime, an annual exhibition of roses was established welcoming all roses’ growers from ROSHEIM and around. 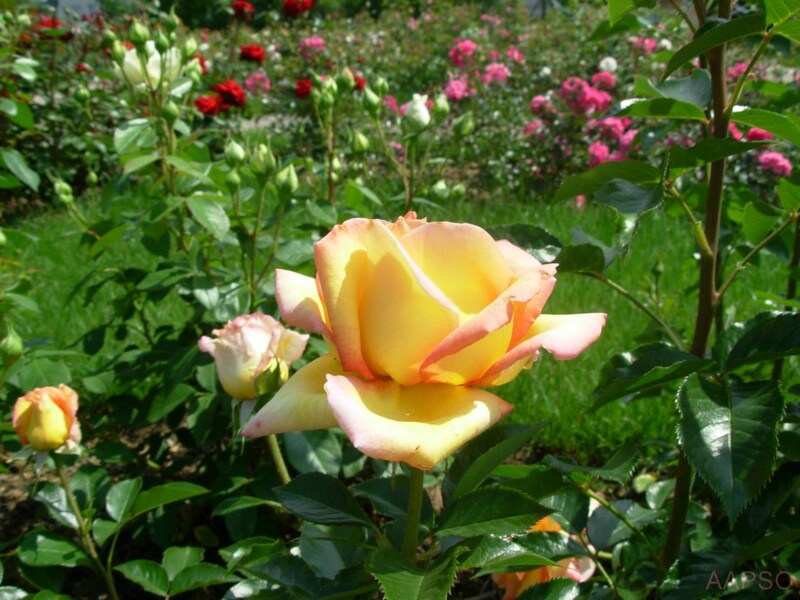 To the delight of the visitors, participants would compete in the most beautiful flower, the most perfumed or the most spectacular bouquet, keeping the motivation of the rose garden project holders alive and only getting stronger. In 1995, an association member welcomed the Rose Garden on his land in ROSHEIM; soon, this site became too small and threatened by surrounding residential developments thus triggering a new move. It is only in 2003 that the town sublet the current area of the Roseraie site, on 28 Ares of communal land. This is the current ROSHEIM Rose Garden. Under the association’s president ECK Gilbert’s input, grubbing started manually in 2003, but the machines were needed to help. In the meantime and up to October 2004, the association worked on the design and landscaping under the supervision of Jean Jacques RISS, helped by Marc SCHROETTER, in order to create the harmonious environment visitors enjoy today: cobbled bed borders, layout of beds for ease in maintenance of the roses and pavement to welcome disabled visitors,…. 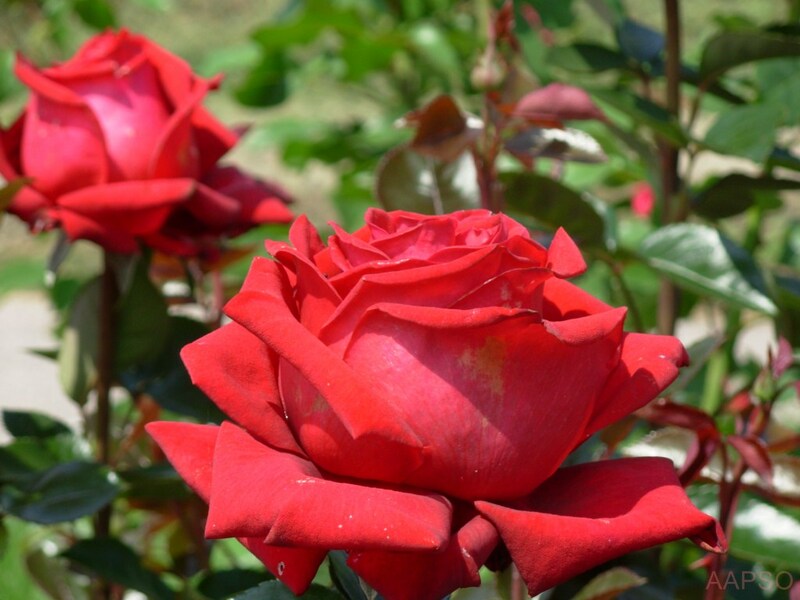 In April 2006, the first 560 rose bushes with over a 100 different varieties were planted. Many more have been planted since and the grass was green on the day of the official opening, 3rd June 2007. Today, the Rose Garden comprises of 1500 roses, including 128 “rosiers tige” and 17 climbing roses. There are 350 different varieties.